By the late 1920's, Marshall Durbin, Sr. had entered the real estate business. However, with the stock market crash in October of 1929, and the subsequent Great Depression, he quickly decided that selling real estate would not allow him to make a living. In 1930, with $500 borrowed from a friend, he opened a retail fish stand in Birmingham, Alabama. Two years later, he opened a second retail stand. Retail fish sales were strong in the fall and winter months but slacked off in the hot summertime. The addition of live poultry, which was a strong summer seller, would add some balance to his budding business. Also during this period, he began to sell fish and poultry to institutions. He opened his first facility in 1935, which would centrally dress poultry and store and distribute seafood. In 1940, he purchased a three-story building in downtown Birmingham. The building was equipped with a cooler and refrigeration equipment. The latest poultry equipment was installed. The broilers were shipped in live from Georgia. The company's distribution and volume increased in 1942, when he started shipping product to the Mobile, Alabama area and the Armed Services. In 1946, modernization and expansion brought the plant's capacity to 2,000 birds per hour, and a branch office was opened in Mobile. Two years later, a processing plant was built in Mobile and a movement had begun to establish contract grower affiliations in Northern Alabama. A new hatchery was built in Birmingham in 1952. At the time, the hatchery could produce 200,000 chicks per week. By this time, the company was producing all of its own birds and its sales area was growing rapidly. In 1953, the Mobile processing plant was enlarged to produce 600,000 pounds of dressed broilers per week. Within the next year, a distribution center in New Orleans, Louisiana was opened to handle the additional production. Contract grower affiliations were added in South Alabama during 1954. This addition boosted the company's production to over two million birds per year. A new 180,000 chicks per week hatchery was built in Haleyville, Alabama in 1958. A year later, a new processing plant was built in Jasper, Alabama that could produce 9,600 birds per hour. In 1961, a bulk feed station was built at State Line, Mississippi. A new hatchery was built in Chatom, Alabama in 1964 with a 200,000 chicks per week capacity. To this point, the company had been buying feed from Ralston Purina. When they increased their price, Marshall Durbin, Sr. decided he could manufacture his own feed cheaper than he could buy it. A $500,000 feed mill was built in Haleyville during 1965, producing 45 tons of feed per hour. With that addition, one of the first vertically integrated poultry companies in the United States was created. In 1966, a transportation office and shop were built in Delmar, Alabama to serve the North Alabama complex. 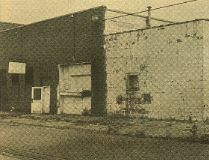 1967 brought an expansion at the Jasper plant. In 1968, the company purchased the production facilities of the Merchants Company at Hattiesburg, Mississippi. A 4,800 bird per hour processing plant, a rendering plant and a hatchery were included in the acquisition. The following year, the Hattiesburg plant was expanded, doubling the production there. A new 75-ton ice plant, a fleet garage, and a warehouse were also built that year. 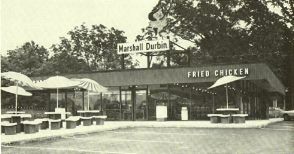 The company entered the growing fast food industry when three restaurants were opened in 1969 at Dothan and Enterprise, Alabama and Carrolton, Georgia. Chicken and hamburgers are the primary menu items. This arm of the company was phased out in 1972. The decade of the '70's would prove to be a bittersweet time for the company. In 1970, the company enlarged the Hattiesburg plant and doubled the capacity of the rendering plant. The Mobile processing plant was also closed. A new corporate office was built in 1970. Located in Birmingham, it also featured a further processing plant below. After a battle with leukemia, Marshall Durbin, Sr. died in 1971. His reputation among his peers was that he was a solid thinker, planner and organizer. He was a co-founder of the Southeastern Poultry and Egg Association in 1948. Through the years, he also co-founded the National Broiler Council, the Alabama Poultry and Egg Association and the National Broiler Marketing Association. In 1969, he became the fourth person inducted into the Alabama Poultry Hall of Fame. In speaking of his father, Marshall Durbin, Jr. said, "His principle business philosophy was hard work and lots of it. In the early years, he would be on the streets making personal calls to hotels and restaurants at 4 a.m., calling on the chefs in person. There was a lot of competition, and often the company that got the business was the first one there. He always tried to be the first one there." However, Marshall Durbin, Jr. had been learning the family business since he was 12. After his graduation from college in 1956, he had worked for the company on a full-time basis and was ready to provide the leadership and direction the company would need. During this time, the company was processing around 40 million chickens a year. In 1973, he spear-headed the acquisition of four Mississippi poultry firms; Canton Poultry, Inc. and the Carthage-based Leake County Milling Company, Inc., Leake County Hatchery, Inc. and Leake County Trucking Company, Inc. This middle Mississippi complex boosted company production to 1.22 million birds per week. 1974 would be a tremendous year of growth for the company, with a new feed mill, complex office and garage being built in Waynesboro, Mississippi while a 285,000 bird per week processing plant was opened in Canton, Mississippi. The company increased its attention on quality when it became one of the first poultry companies in the nation to establish a science and technology center. Located in Jackson, Mississippi, the lab was dedicated to product safety and consumer health and was a significant investment for the company. The Birmingham hatchery would close in 1976, but a new hatchery would be built in Haleyville as its replacement. This would give the company two hatcheries in Haleyville. The Chatom hatchery's production was doubled in 1977 with the installation of new equipment. In 1978, Marshall Durbin, Jr. was inducted into the Alabama Poultry Hall of Fame while a new feed mill, hatchery and fleet garage were being built in Philadelphia, Mississippi. A new laboratory in Jackson and a remodeling of the Hattiesburg rendering plant were completed in 1979. By 1996, the company was producing 111 million chickens a year. In 1997, Marshall Durbin, Sr. was posthumously inducted into the University of Alabama Business Hall of Fame. Another milestone event for the company occurred in September of 2001, when Marshall Durbin, Jr. passed away. His two daughters, Melissa and Elise, became owners of the company. In 2012, the company purchased a hatchery in Moulton, Alabama.